TV czarina Ekta Kapoor recently became a mother and we are really happy for her. She also hosted naming ceremony for her newborn son Ravie Kapoor in and the who’s who of the film and TV industries graced the event to give their blessing to the new born. @karanjohar with mother #hiroojohar at #ektakapoor residence. To celebrate namkaran of new born #raviekapoor. #abhishekbachchan #shwetabachchannanda at #ektakapoor residence. For celebration of namkaran of new born #raviekapoor. The Bachchan’s in the house. Shweta Nanda and Abhishek Kapoor were also seen at Ekta Kapoor’s baby christening. The duo had also made an appearance together in the talk show Koffee With Karan. Once the most loved bahu of the Indian television and today one of the cabinet holder, Smriti Irani too was present for this occasion. From Tulsi to Parvati. Sakshi Tanwar too also present for this occasion. GIFT IDEAS at #ektakapoor residence to celebrate namkaran of ekta kpoor's new born son #raviekapoor. Ekta Kapoor’s old friend and producer Nivedita Basu was seen getting into the party bearing gifts. #anitahansnandani with husband at #ektakapoor residence to celebrate namkaran of ekta kpoor's new born son #raviekapoor. Another cute couple Anita Hassanandani and Rohit Reddy too were a part of Ekta’s special moment. While Rohit kept it traditional, Anita opted for a stylish blue dress. The duo were also recently seen in a music album that is doing well. Shabbir Ahluwalia and Kanchi Kaul too were at the party looking adorable as ever. Krystal D’Souza opted for an Indian attire for the occasion and she was looking drop dead gorgeous. 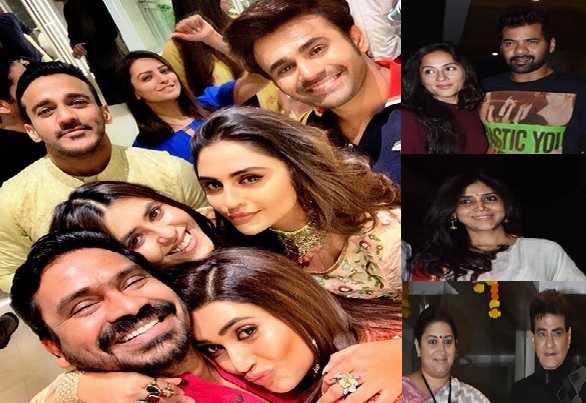 The Naagin 3 star Pearl V Puri along with Mushtaq Sheikh, Anita Hassanandani, Vikas Gupta and Additi Gupta also posed for a selfie with Ekta Kapoor. Actress Surbhi Jyoti too took a click or two with Producer Ekta Kapoor. Currently Surbhi stars in Ekta Kapoor’s Naagin 3. Everyone to be on Ekta’s good books!!! !